A colour-illustrated guide to hemophilia. It is the perfect educational tool for parents, nurses and other healthcare providers, and anyone seeking to transmit basic information about hemophilia and its management. 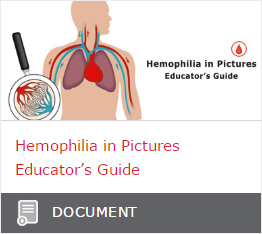 A companion to Hemophilia in Pictures, this Educator’s guide provides more detailed information for advanced learning. Also includes tips for effective patient education, key talking points, and review quizzes. A colour-illustrated guide to hemophilia. Hemophilia in Pictures is the perfect educational tool for parents, nurses,and other healthcare providers, and anyone seeking to transmit basic information about hemophilia and its management. This online module allows learners to progress through the material at their own pace and includes a glossary.